It’s September. High School graduation is next May. 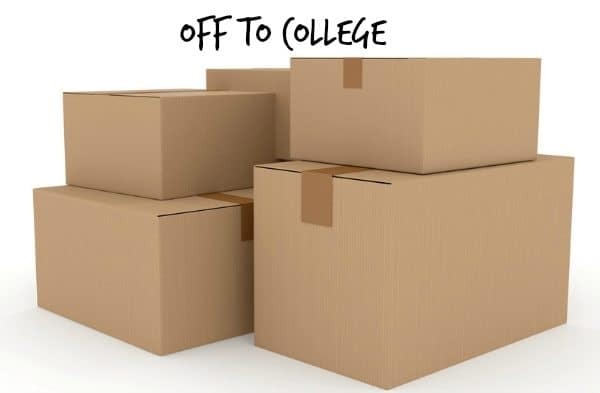 And I have already assembled most of what my daughter is going to need for the college dorm room she won’t be moving into for almost an entire year. There. See? I practically saw the look, right through the screen. You think I’m nuts. I get it. On the one hand, we have Bargain Shopper me at work; now that school has begun, there are plenty of sales on dorm-type necessities as all of the current college students have already outfitted their spaces. As someone who’s been starting Christmas shopping every January for most of my life, it makes perfect sense that I’d jump on these sales rather than waiting to shop with the rest of the world next summer. Saving money via early bargain-hunting is my thing. The “sales” stores will be advertising next July can’t come close to the markdowns I’m ferreting out right now. So part of it is a money issue. Several of my friends have kids who headed off to college last month, and more than one of them availed themselves of the now-trendy option of using an online “bundle” service. (This is not an endorsement of any kind, just my quick Googling: check out DormCo.com’s bundles if you’re not sure what I mean.) It’s a significant savings over buying the pieces individually, one of my friends assured me, so why wouldn’t I just do that? I checked it out; although there are some choices you can make within their framework, overall I found their product offerings kind of limited. Is it a great idea if you just want to buy it all and be done, and the eventual owner isn’t all that picky? Sure. If you have a kid who has definite likes and dislikes and various tactile sensitivities and you join me in wondering when, exactly, “easy care microfiber” became the standard for cheap bedding (easy care = slide ride off the slick surface onto the floor), you might find that this isn’t the route for you. And it wasn’t going to be the right route for us. And on the other hand, this is about a lot more than bargains, or pickiness. This is about change. This is about meeting my child where she is in the best way I know how, and if that looks silly from the outside world, so be it. My high school senior has had a bumpy road to this point. She’s one of the strongest and bravest people I know, and she has fought tooth and nail to be where she is right now: healthy, happy, successful, and thinking about her future. Given all that came in the years leading up to now, I quite literally could not have asked for more. She’s exactly where she needs to be to launch into adulthood when the time comes, and I know she has an amazing life ahead and (finally) in reach. I also know that change is terrifying—for everyone, to some extent, but especially for her. I know that if I wait and we start shopping next June that anxiety will be our constant companion. I know she’ll overthink every choice, become mired in indecision, and what should be a joyful time of anticipation could become something else entirely. I know that when I left home at her age I couldn’t wait to leave, but she’ll have a very different experience, excitement tempered because she’ll be leaving her safe haven. I know that if she isn’t surrounded by the colors she loves, the sheets that feel “right,” everything just so, it will be that much harder for her to see college as the next big adventure. I know that if we spend this whole year preparing, it will soften the blow when the time comes to say goodbye. There’s so much change coming, for her. So many things I can’t control or even help her with or slow down to make it easier. She’ll handle it—she’s ready—but in the meantime, I can spend this year sending her unspoken messages of unwavering support the best way I know how. I bought a mattress topper. You are going away to college next year. No maybes. You’re ready. I found some nice, fluffy pillows. You’ll find a way to make yourself comfy and cozy without us, I promise. Mattress and pillow protectors; check. I’ll always be here for backup, even when I’m not with you. We sat down and looked at towels together, discussing the pros and cons of standard towel sets vs. what she’ll actually use, and then we ordered exactly what she wanted. Look at you, making choices, looking ahead, getting ready to fly. After a lot of searching and working my coupon mojo, I was able to snag a couple of really nice cotton sheet sets in her favorite colors. Will you miss your bed here? Probably. But your one there will be pretty rad. She spent some time looking for the “perfect” duvet cover, and when she couldn’t find it, we picked out fabric to make one, instead. Your space will be completely your own and unique, because you’re one of a kind. Some of the purchases we’ve decided together; some I’ve gone ahead with and showed her when they arrived; others are hidden, surprises yet to be revealed. Every single acquisition is a silent love letter. By the time we step into her dorm, next summer, letting go is still going to be hard. I know that. But if it’s even a tiny bit easier thanks to a whole year of slow and matter-of-fact preparation? That’s a win. Bonus: her room is going to look amazing. Thank you for sharing the paths. Heh. My mother sent me off with some old extra stuff she had lying around. Some of it was broken or shoddy. She implored on me to reconsider leaving for college because she was afraid for me. A couple years of frugal living later, some friends saw how bad my things were and took me shopping, because they were appalled.Yeah, I think you’re doing fine. This comment makes me want to take you shopping. I’m glad you had friends to do it, at least. Suggestion from a mom who just sent a daughter to college… One also overcoming similar hurdles. I would recommend having her enjoy a pillow or comforter or something now. That way it won’t all feel unfamiliar those first weeks in a new room/dorm. We gave our big girl a new comforter set for senior year Christmas. That was the familiar item that went to college this fall. Towels, sheets, etc were all purchased on sales throughout the year to coordinate with the comforter…. Ooooooh good idea. Of course currently she is in a queen bed and will be headed to a twinXL (makes doing the bedding now hard…), but I’ll see if she wants to break in the pillows. Thank you! !